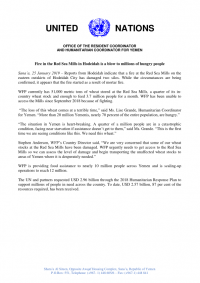 Sana’a, 25 January 2019 – Reports from Hodeidah indicate that a fire at the Red Sea Mills on the eastern outskirts of Hodeidah City has damaged two silos. While the circumstances are being confirmed, it appears that the fire started as a result of mortar fire. WFP currently has 51,000 metric tons of wheat stored at the Red Sea Mills, a quarter of its incountry wheat stock and enough to feed 3.7 million people for a month. WFP has been unable to access the Mills since September 2018 because of fighting. WFP is providing food assistance to nearly 10 million people across Yemen and is scaling-up operations to reach 12 million.